I finished another altered vintage book. The original was a book on Sunday School teaching methods and teachers. I will use the book as a journal about teaching and teachers. The entire text of Teaching and Teachers is available on google books. The book was in fair condition, considering its age. 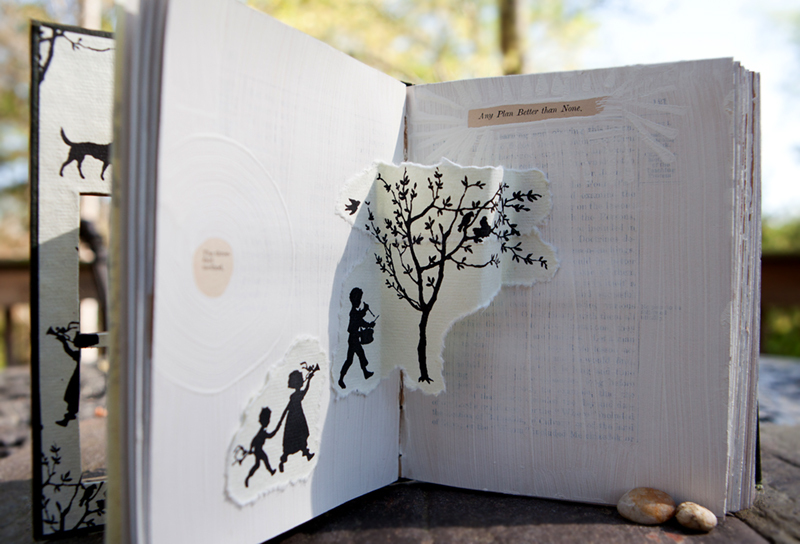 I cut a window shape in the book cover and used a sheet of beautiful textured paper with silhouettes of children for the endpaper. The window frame is pieces of wood that I stained with red, green and brown paint to look aged. 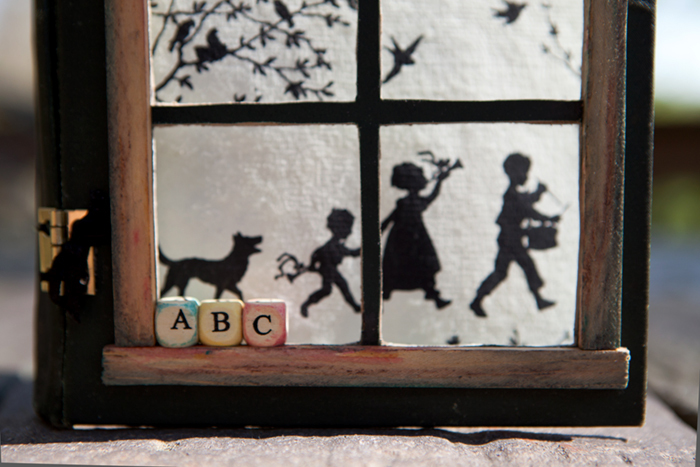 Altered vintage book – Wood alphabet beads are colored and glued to the window sill to look like alphabet blocks. I removed many pages from the books, especially damaged pages, which were set aside in order to glue interesting paragraphs back into the book later. 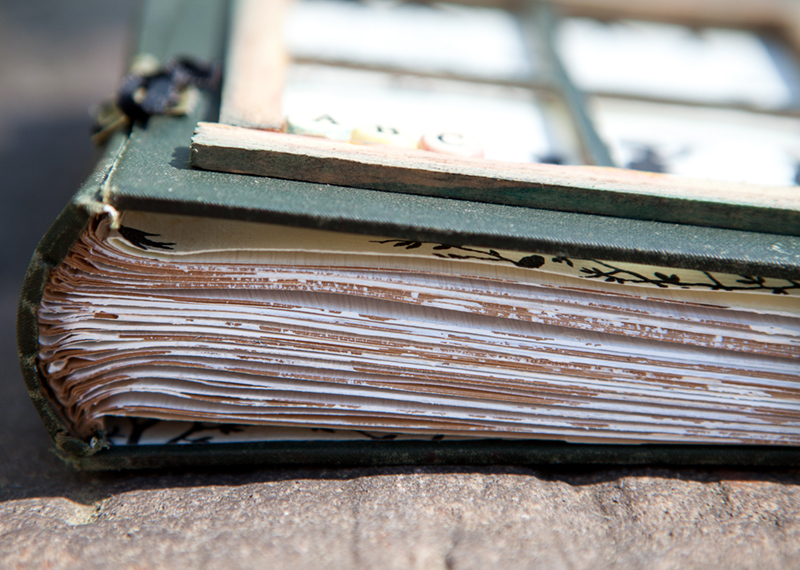 The pages remaining in the book were glued together in bundles in order to make them more sturdy and then coated with gesso to provide a surface for journaling. Both front and back covers were cut off the book and then reattached to the spine. I removed all the crumbling and dry rotted material from the spine and then reattached the covers. 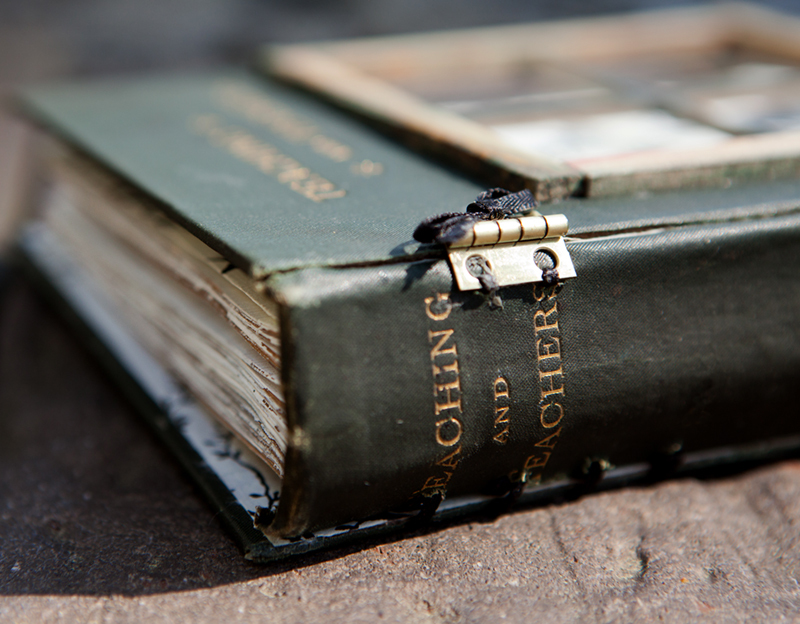 The front covers are attached using small hinges tied on with black ribbon. The back covers are hole punched and stitched to the spine with black ribbon. This binding allows the book to be opened flat. 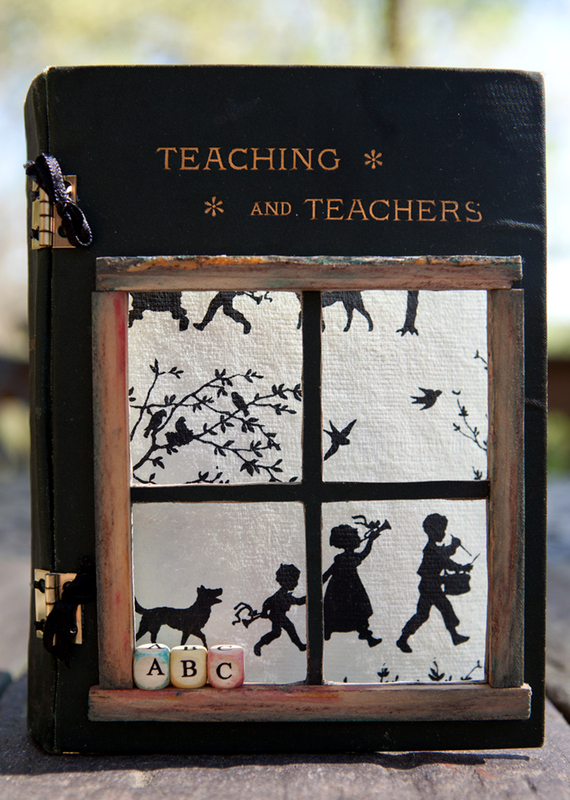 Inside the front cover – decorative silhouette paper provided the perfect design for a book about teaching. A peek inside Teaching and Teachers altered book. The original book was devoid of illustration. 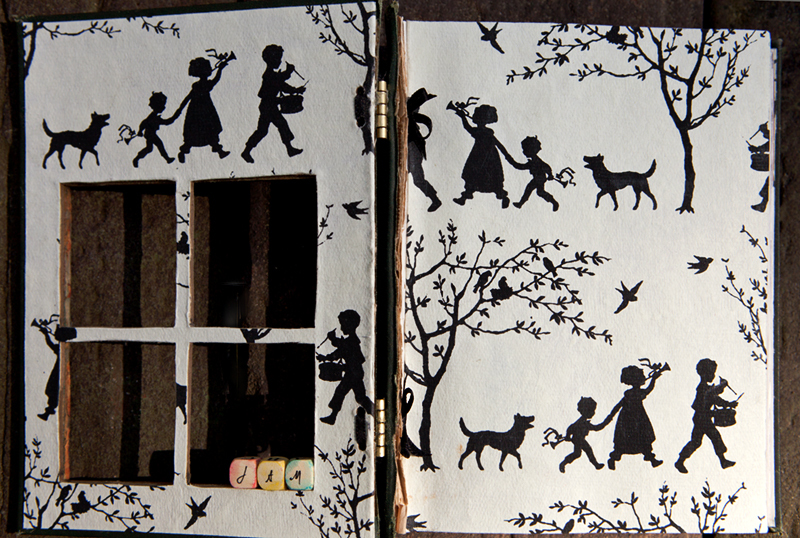 I tore out motifs from the decorative paper and glued them on some of the pages. While applying gesso to the pages, I read each page first to see if there was a quote I wanted to showcase. For this spread, I kept the small side bar “The three-fold method” and the chapter title “Any Plan Better Than None” by spreading gesso carefully around the text. I was a homeschool mom for 24 years and taught Sunday School for many years so I’m looking forward to filling this book with thoughts on teaching and teachers.